When I was little I used to wonder what ‘cream of’ meant. Did it refer to being made with the ‘cream of the crop’, was it that the ingredients were ‘creamed’ or was it that cream was added. 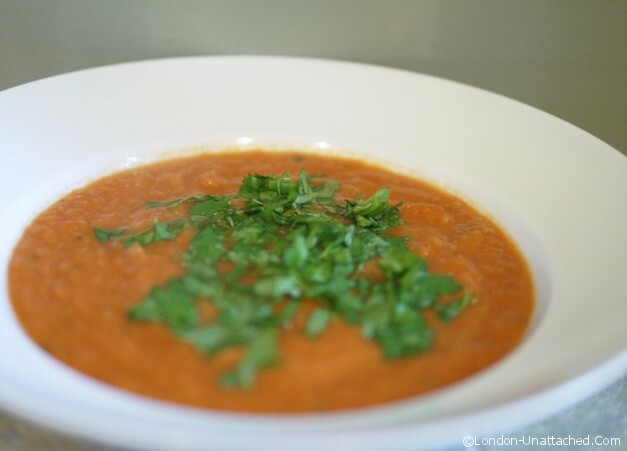 It seemed incongruous with soup – and still seems even more incongruous with this 5:2 diet recipe for tomato soup. In fact I still don’t really know what ‘cream of’ means, but for sheer nostalgia I love Heinz cream of tomato soup with a slice of hot buttered toast. I like making my own soups for the 5:2 diet though and ‘fresh’ soup somehow tastes quite different to canned, even if like this particular recipe it relies for the most part on a canned ingredient. Almost as much of a mystery as the meaning of ‘cream of’, especially when applied to a 5:2 diet recipe where it’s a good idea to avoid cream at all costs. This particular recipe was an experiment to try some almond milk which I was sent last week. And, to pick up on an idea that one of my friends pinned for ‘creamy cauliflower sauce’. Having made a rather lovely fresh tomato soup recipe for the 5:2 diet a month or so ago when there was a glut, I was keen to see if I could get close to that lighter, tangier flavour that you get from fresh tomatoes, but using a can. Almond milk is something of a revelation for me. It is lower in calories and carbohydrates than regular milk and although it has a higher fat content, like oily fish it’s the type of fat that doesn’t cause cholesterol. Now, I have a thyroid problem which means that in the morning I have a tablet that should be taken at least twenty minutes before having anything like milk with calcium in it. You wouldn’t believe how much I crave a morning cup of coffee! Almond milk is fine though, and works as a great substitute in my morning cuppa. Of course it’s also suitable for those who are lactose intolerant or who are following a vegan diet. Spray the bottom of a heavy based pan with 1cal spray and gently sweat the shallot till soft. Bring to a gentle simmer and cook for 15 minutes. 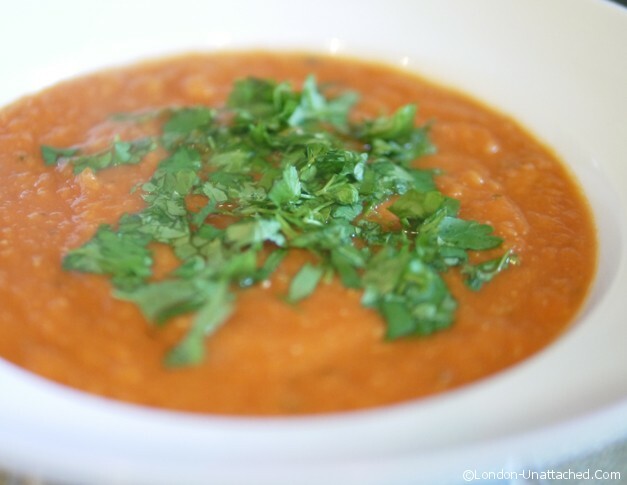 This Cream of Tomato soup is indeed creamy, thanks to the almond milk. And it has a lot of texture, which I believe is down to the cauliflower. It manages somehow not to taste of canned tomatoes, again I think because of the addition of cauliflower and shallots. 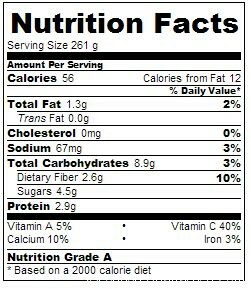 Finally it’s ultra low in calories but filling and substantial, just like a winter soup should be. If my quantities make too thick a soup for your personal taste add a little more almond milk for a silky smooth texture. Tomato soup is pretty much a fast day staple for me, not tried it with cauliflower before though. It just takes a bit of the acidic edge off the soup – like adding a dollop of cream but without the calories!!! The cauliflower is a mad and wonderful idea..I am going to use it . Thanks. Your soup sounds good, Though not lactose intolerant, I have been drinking almond milk for years. that’s awesome!! It looks fab. I have been doing the almond milk thing too. I am not a huge fan of milk..but I eat yogurt and cheese. But Almond Milk – -that I like. unsweetened vanilla flavor. That would be an awesome thing in tomato soup. sounds terrific! Good looking soup which I will try making with fresh tomatoes. I am not a fan of canned anything, but I llike my almond milk, and Cauliflower will make it “creamy” so I’ll try it as soon as the weather takes a downward turn, which should be in about another month.